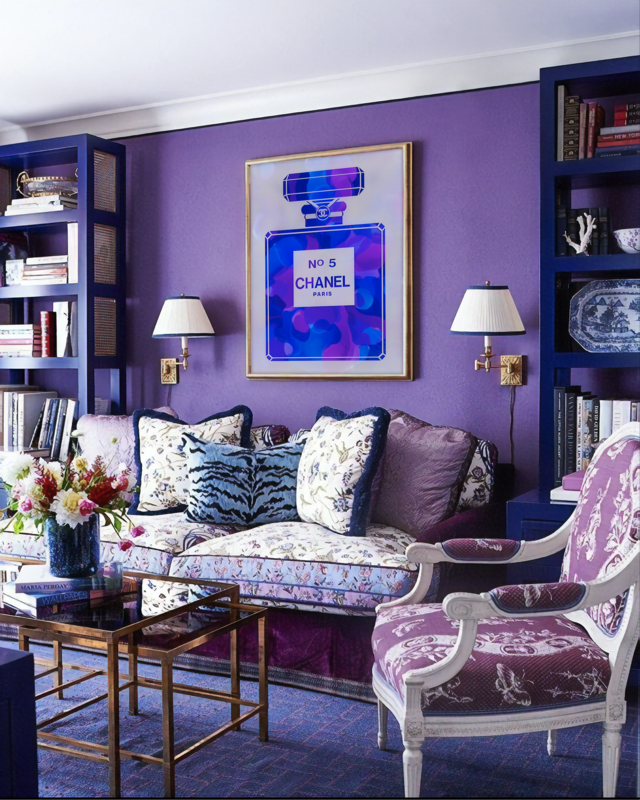 Tune in to this year’s Pantone color of the year—Ultra Violet, a shade of purple that “communicates originality, ingenuity and visionary thinking.” Whether using the bold color to take charge of an eclectic interior, enrich a delicate room, or balance violet highlights, always choose art that complements your expressive vision. Embrace the originality of ultra violet with intoxicating palettes and patterns by pushing the color to its maximum. The bright, assertive hues in Alberto Murillo’s work give this eclectic interior an edge of sophisticated drama. Paired with the cool-toned floral and animal patterns throughout the interior, the flowing forms in “Just Two Drops: Blue” add another textural dimension. Alberto Murillo, “Just Two Drops: Blue”, Mixed Media with Resin on Wood, 40 × 30 inches. Take a delicate approach to the color: Alice Pritchard’s “Sweet Pea” painting finishes the soft and feminine details of this space, exploring a more subdued interpretation of the hue. Alice Pritchard, “Sweet Pea”, Pastel on Canvas, 48 × 48 inches. The deep, subdued blues in Shivani Dugar’s “Winters at the Lodge” rounds off the color palette of this elegant interior. The bright, deep violets throughout the room contrast amidst the clean palette, and the painting introduces another set of tonality, harmoniously balancing the colors throughout. Shivani Dugar, “Winters at the Lodge”, Oil on Canvas, 60 × 48 inches.